This level have again jelly requirement and you need break all within just 20 moves and that’s not easy. This level candy board have 66 candies with 16 jellies, three chocolates and 12 meringue blocks. To complete this level first you should try to break all chocolates so they wont increase later and then break other blockers. You should then increase moon power and as it will struck will break lot of same color candies and give chance to make special candies. You need to combine special candies to each other to complete this level and don’t forget to balance the Owl. 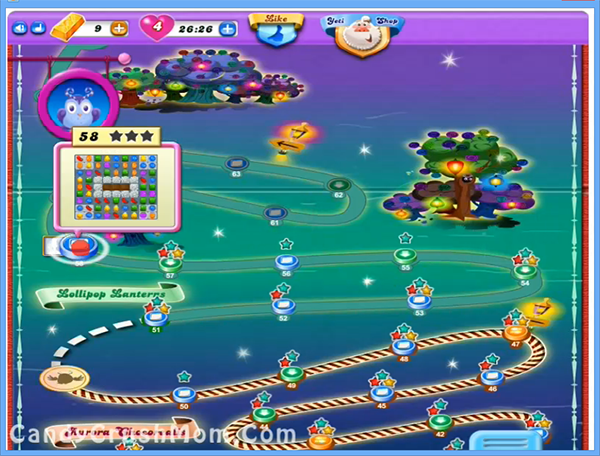 We completed this level 116780 score by creating lot of special candies and get three star points on score board.